Being 50+ and not willing to spend hours swapping on Tinder does not mean that online dating is not for you. Senior dating can be very enjoyable if you know where to look. There are great websites and apps out there, that can give you access to many great profiles, just like yours. First, you should identify the type of person you are trying to find. Then, have a look at these senior online dating website, and select the one(s) that will make your dreams come true. It is time to find like-minded people who ready to meet someone and enjoy the senior life together. 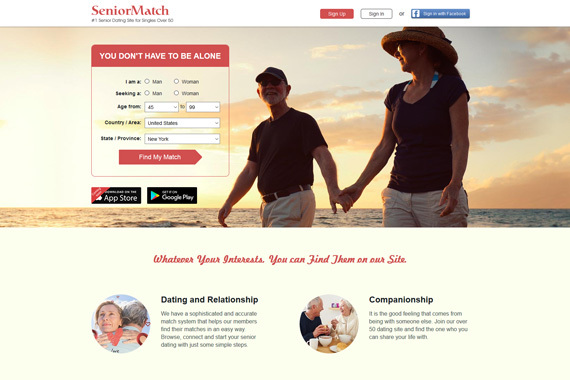 SeniorMatch is the number 1 online dating website and app for senior dating, and they have earned it. Signing-up is free and enables you to start browsing members with specific gender and area criteria. With a great policy of no members under 30 and an uncomplicated Premium optional subscription, meeting someone your age has never been easier. The design is simple, and their app, available on Apple devices and Android, very responsive. 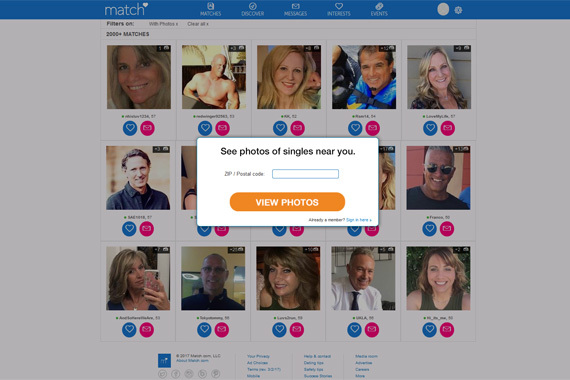 Sticking to the core of online dating websites, SeniorMatch makes it easy and relaxed to meet new people. 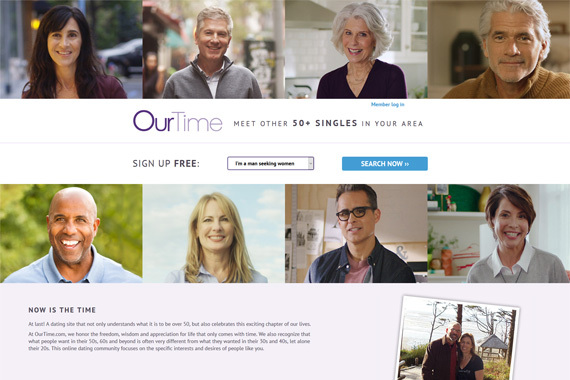 OurTime is the rising star of the senior online dating websites niche. Focusing exclusively on 50+ members, Our Time has gained the trust of many seniors over the years. The concept is more social than on other websites, as Our Time will also organise group activities, so you can meet seniors in real-life and see how the chemistry works beyond the usual message exchange. Verified profiles and a dedicated customer service will make your experience enjoyable, and get everything ready for love to enter your life. 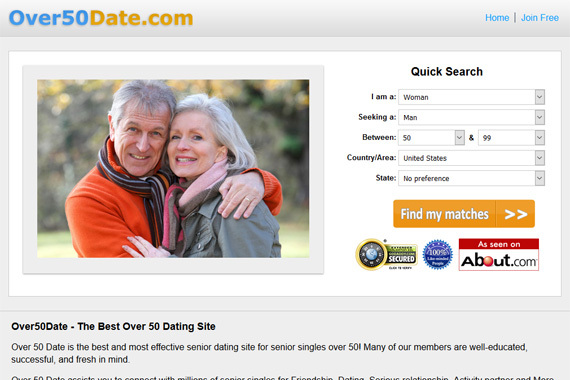 As its name suggests, Over50Date is a senior dating website designed for singles over 50. It has been around for many years already, and is a very reliable one. Joining the website is free, and you'll have access to thousands of profiles. They also have an Over 50 Dating Blog, with many great articles and tips to ensure that your senior dating experience is the best possible. With a simple search system and different amazing profiles, there is no reason Over50Date won't lead you to wonderful life experiences. In the world of dating website, the more demanding, the better. When joining such a website, seniors who are new to the concept might be worried that the website doesn't know them or what they are looking for. With SilverSingles, there's no such doubt. When signing-up, new members are asked to fill a very detailed questionnaire about their personality, lifestyle and expectations. The test has been developed alongside with scientists, to guarantee the best pairing possible. If you believe in match at first connection, don't hesitate! 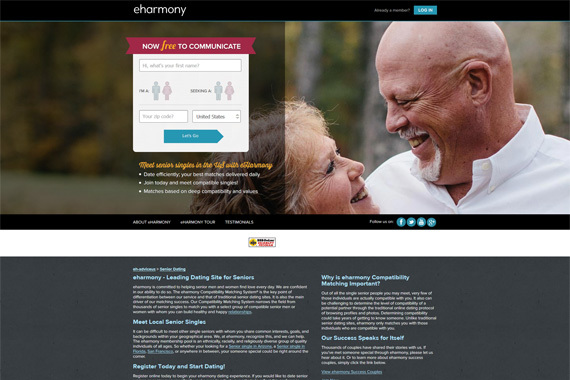 For straight singles in their 50s, eHarmony is a great online dating website. More orientated towards building a strong and long-term relationship than a casual flirt, eHarmony wants to make sure that you only match with singles who are perfect for you. The matching system is the usual one, answering questions about yourself will give you access to similar profiles. However, forget long hours browsing through countless profiles. Every day, eHarmony will send you a list of people who might be the one for you, all you have to do is go and take a look at their profile, making your senior dating experience hassle-free. 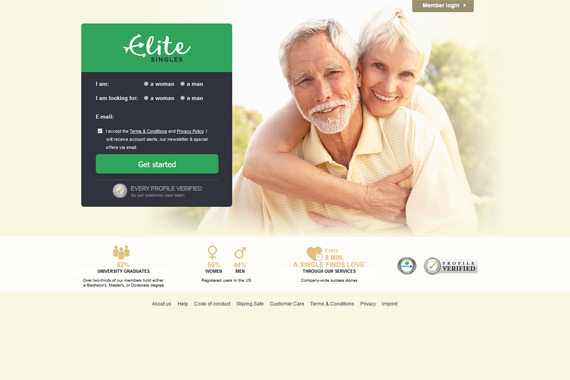 EliteSingles is a dating website that will make sure that you find someone not only your age, but with whom you can share interesting discussions and that will have the same educational background. With a balanced women-men ratio - 56/44 - the great majority - 82% - of the website's population is a university graduate. EliteSingles is a highly qualitative website, with all profiles being manually verified to avoid any disappointment or trouble. Indeed, the success stories are impressive, and you will find yourself believing that your other élite half is just a click away…Dating over 50 has never been simpler. Match is not specialized in senior online dating, but it has proven to be very successful for all age ranges. Online since 1995, Match has the biggest user base in the world of online dating, therefore it is statistically more likely to find your perfect match on it. Safe, secured and developing new features all the time, Match is reassuring, as most people have heard of it. With their huge user base, Match is the dating website with the most 50+ users registered on it. It is certainly worth giving it a go, if you haven't! 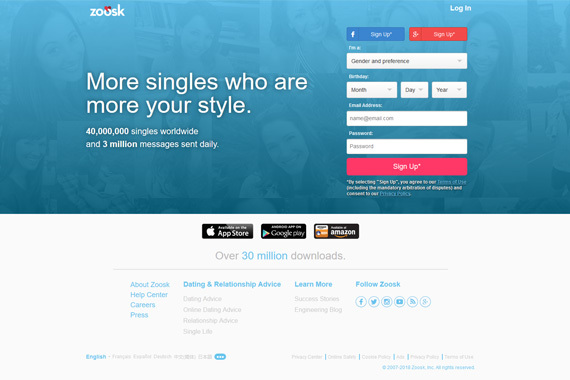 Not focused on senior dating, Zoosk is very popular amongst every age category. The website has a fantastic user base, ensuring that you will find plenty of 50+ to match with. Zoosk's matching system is quite the usual one, your preferences and answers about your lifestyle will give you access to profiles, and then you can start chatting with whomever inspires you the most. For seniors who work or are always on the run, Zoosk also has an app so being aways from your computer doesn't mean you can't chat. There are many ways to become a senior, and many websites to find love as a senior. If you believe in online dating, the options are numerous. Senior online dating is very accessible, and there is no reason why you couldn’t have a great time. 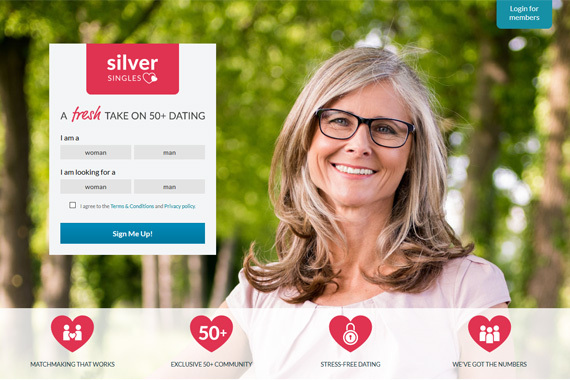 Whether it's someone your age, or your soul mat, the match you were waiting has never been easier to find on these 50+ dating websites.